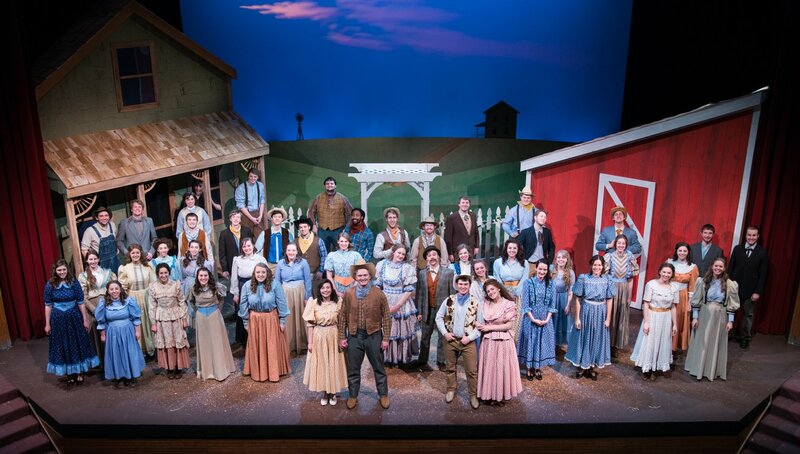 Unlike many students involved in plays and musicals, I began Oklahoma! as a complete theater novice. While others were brimming with excitement to audition for their desired parts, I was content to test out the waters of musical theater. Due to my friends’ enthusiasm for theater and their insistence that it was a once-in-a-lifetime experience I would never forget, I knew I would enjoy my brief time onstage. I was looking forward to performing, but I never expected it to be the highlight of my college career. For our first official meeting, our schedules were handed out, lengthy and filled to the brim with dates, times, and other necessary information. It was at this point that I fully understood the time commitment of a show of this magnitude, and felt slightly intimidated and out of my league. Further proving my inexperience in theater, I whispered to my friend, out of earshot of anyone else, what “Tech week” and “strike” meant—common theater terms, but new to me. The nervousness that l would not be as enthused about the production as theater or music people crept in on my thoughts. As I would find out, it was impossible not to be enthused as you entered onstage and began singing. A month of rehearsals ended just as quickly as it had started, and as tech week began, something dawned on me: I felt like a true theater person, not just an English major trying out musical theater for a month. I felt right at home—I could contributing just as much to the show as the theater major standing next to me was. When performances arrived, there was undoubtedly a collective exhaustion among the cast. However, even though we were tired, an outsider would never be able to tell from our performances. It was astounding that something that took so much time and effort could be such a joy to work on. In fact, two to five hour-long rehearsals could be just as fun as the actual performances themselves. The onstage production was only half the fun of the experience as the whole. The antics among the cast, onstage and off, was what made this production unique, and not just another performance of Oklahoma! For every song being sung onstage, there were at least five people in the wings lip-syncing the words, giving their own performance. The girls longed to be one of the men singing “It’s a Scandal,” stomping their feet behind the curtain in unison with the men. What kept the energy going onstage were the countless storylines the cast interweaved into their own performances. The storylines amongst ourselves continued to grow even more complex than the plot of the actual show. There is a specific kind of creativity that comes with being in theater. Even though you have to rehearse the scripted lines and songs, what defines a performances is the way the actors integrate their own experiences and creativity into the performance. All the discomfort that I felt during the week went away for each performance. I was surviving on short naps during tech week and performances, but my tiredness went away because of the palpable energy of the crowd. My feet were blistered and sore, but I couldn’t feel any discomfort during the middle of a song. My body was begging me to rest, but my mind was more than ready to keep performing. The contagious energy from the cast, crowd, and the musical itself was more than enough to make me wish the experience never ended. Luckily, I have Spotify, because I’m still not tired of the songs, and I’m content to have a few of them stuck in my head at any given moment. One particular thought struck me as we were finishing up performances: if I had attended any other college, I would not have even considered being in a musical. But Bethany’s small cast and crew was the perfect place to try it out, and I was able to find immense joy and fulfilment performing in the show, despite not being a theater or music major. No, I may not be a traditional theater person, but for the month of January, I undoubtedly was, and will continue to be for the next few choraliers I take part of in the coming years. Emeline Ring is a freshman at Bethany majoring in English. When she is not busy writing for classes and for The Scroll, she loves reading for hours on end with a cup of tea in hand while listening to the sound of rain.